Legendary TV movie based on a Theodore Sturgeon story about what happens when a work crew on an isolated island unearths a meteor that has a weird life form attached. The life form leaps from the meteor to a bulldozer and then begins to kill the men off. To be completely honest I never saw this until recently. I've had a DVD of it for a couple of years now but I never took the time to actually sit down and watch it. I have no idea why I never watched it, I'm guessing it was that I feared that it was not going to live up to my expectations which was either as a really good or really bad film. I think I was terrified that I was going to end up with just a really okay film. 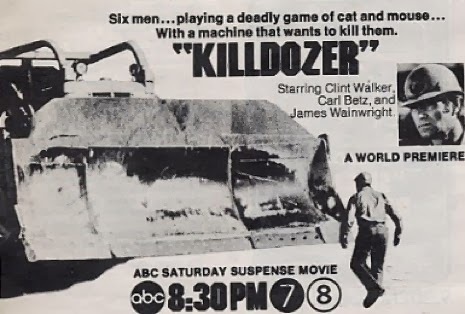 Infinitely scarier than Stephen King's Maximum Overdrive (which is a fun film) this is film that was the talk of the school yard back when it aired on TV. The film has retained a kind of legendary status since then as those that were warped by it talked it up and horror fans who never saw it tried to track it down. I completely understand why the film has maintained even a low level reputation for 40 years- it's a really good little film. The films problems are more to do with the limitations it had coming from TV. There are things about the set up and cliche character development that keep the first say 20 minutes just okay. We've been here before. We've done all of this. We just want to get on to the good stuff. Definitely one to track down or catch on its rare TV showings.